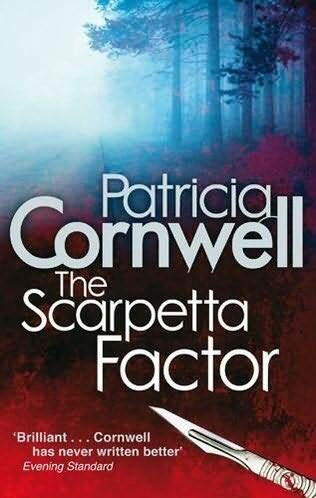 It’s a Mystery: The Scarpetta Factor, by Patricia Cornwell | You're History! Kay and Benton are happily married, Lucy is in a long term relationship, as is Marino. All are continuing their careers in the northeast, dividing time between Massachusetts and New York City. But murder is murder, so some things haven’t changed. As usual, there are multiple plot lines. The book opens with Kay performing the autopsy of a female runner whose body was found in Central Park. On the same day, Benton receives a creepy Christmas card from a recently released mental patient of his, while Lucy and her partner are working on the case of a missing financial pro. Marino observes the attempted rescue of a man threatening to jump from the GW bridge. Kay has been doing guest spots on a new talk show about forensics, and, besides increasing her public profile, something happens on air that seems to tie some of the elements of the three cases together. Gradually, it becomes evident that there is a complex conspiracy in the works, and the past returns to haunt Kay, Benton, Marino, and Lucy, in different but devastating ways. Eventually, justice prevails, but the investigators are granted a tremendous advantage because of the high tech GPS watch worn by the dead runner, who was a subject in a medical research project. Technology, coincidence, timing, and, of course, the superlative skills of Scarpetta’s cohorts, combine to bring about a satisfactory termination to the macabre crime spree.